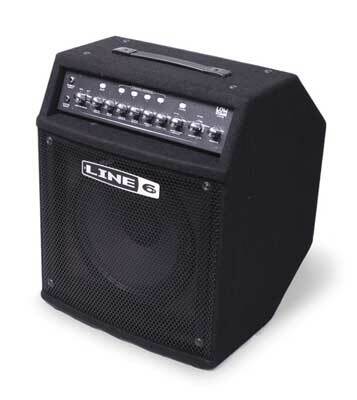 The LIne 6 LowDown LD15 provides pro bass tone at an unprecedented price and the opportunity to get a great sound instantly. The LowDown LD15 offers pro-grade tone control reminiscent of that of higher priced bass rigs. Broad-sweeping Bass, Lo-Mid, Hi-Mid and Treble controls make finding the perfect sound a snap. Plus, with a dedicated Drive knob a little extra character is just a twist away. 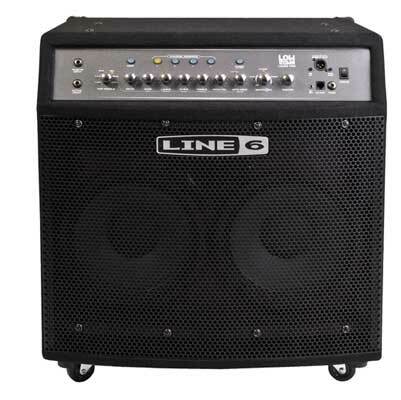 The Line 6 LowDown LD15 delivers a wide range of essential sounds for every bass player. Clean provides a pristine fusion and funk bass tone perfect for slap, R&B is a tribute to those fat Motown bass tones, Rock captures the seminal tones of classic 8x10 inch stadium rock amplifiers that have appeared on innumerable stages and recordings and, Grind, as the name suggests, supplies plenty of punchy aggression and distortion for that modern rock bass tone. Each model's parameters are fully adjustable, and can be stored for instant recall at the touch of a button! 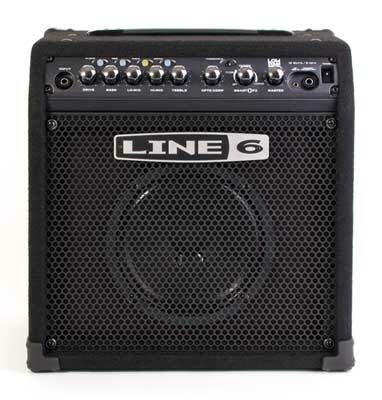 Line 6 LD15 Features 15 watts; 8 inch speaker 4 fully adjustable Line 6 bass models including Clean, R&B, Rock and Grind 4 user-programmable channel memories 3 Smart Control FX for bass including Envelope Filter, Octaver and Chorus Adjustable opto Compressor with threshold LED Pro Tone control features Bass, Lo-Mid, Hi-Mid, Treble and Drive knobs CD/MP3 input for playing along to any music Headphone/recording output ideal for practicing and direct recording Three Smart Control FX don the front panel of LowDown LD15 offering a variety of tonal options unprecedented in a 15-watt bass amplifier. The Filter delivers a funky wah sound inspired by the baddest envelope filter on the planet, Chorus is transparent, smooth and expressive while not reducing the low-end from your bass signal, and Octaver, producing a single note one octave below the note played, adds a powerful vibe to any jam. A dedicated studio-grade opto compressor model provides a smooth and consistent signal at any volume. This is ideal for every bass player for leveling out the dynamics of your attack. An LED lights up to signify when the compressor hits -5dB of gain reduction. Ideal for jamming and practicing, LowDown LD15 features a CD/MP3 input for playing along to any music. Plus, the headphone output also can be used for easy direct recording of album-ready LowDown bass tones. Rugged, reliable and ready to deliver legendary Line 6 bass tone, The LowDown LD15 is here. Line 6 LowDown Bass Amplifiers, their first ever line of bass amps, delivers an incredible array of dialed-in, stage-perfected bass tones. While most bass combos focus on volume and clean tone, LowDown amps offer five must-have effects and five killer bass amp models, that cover everything from funk to classic rock and beyond. Plus, the oversized, high-speed power amp has incredible articulation and bottom end punch that's ideal for live or studio work. Finally, there's a line of bass combos that give you great tone, performance, and flexibility all at an incredible price. LowDown Amp Models LowDown delivers five carefully crafted amp models that can take you from modern punch to a thunderous, full-on assault! Each model automatically dials up a great sound that you can change to your liking and save into a preset using the channel memories on the front panel. Clean : Inspired by* the Eden Traveler, this model is all about clean, funk and fusion bass tone. It'll give you all the warm lows and punchy highs you need. R & B : Inspired by* a 1968 B-15 Flip Top, this model is a tribute to those late 60's and early 70's clean fat bass tones. It is the kind of tone you hear on most Motown recordings, as played by a pioneering young James Jamerson. Rock - This model is inspired by* the '74 Ampeg SVT. This workhorse has appeared on innumerable recordings and arena stages worldwide. And now all the tone of the 300-pound behemoth 8X10 and head is available in your combo! Brit - Based on a '68 Marshall Super Bass, this model delivers the kind of overdriven bass sound brought to us by late '60's British rock pioneers like Cream and The Who. Grind : As the name would suggest, this is for modern rock lovers, Alice in Chains to Mudvayne and Rage Against The Machine . Based on* a distorted SansAmp PSA-1 into an SVT in addition to a direct clean bass signal mixed in, this model gives you that angry, clear and punchy aggression that takes your sound to DEFCON 1. But that's not all... Synth : Sitting at the back of the model knob is this secret weapon that turns LowDown into a '70s classic bass synth.